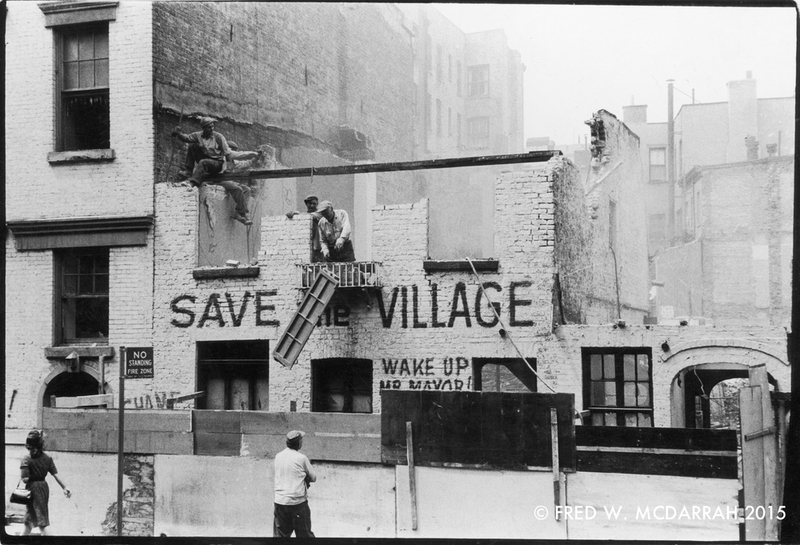 Demolishers dismantle an artist's studio, the facade of which is painted with the slogans 'Save the Village' and 'Wake Up Mr. Mayor!' New York, New York, May 16, 1960. Photo by Fred W. McDarrah. Welcome to the Save the Village Tours blog. In addition to talking about the tours, posting photos of tours and the people on them and the sights that are seen, we will do something else, too. We'll keep track best we can of downtown changes that we feel, well, may be not so good. We're all about supporting the folks that are SAVING what is left (see: Greenwich Village Society for Historic Preservation, gvshp.org/) and doing whatever little bit we can to keep Greenwich Village what is was, and is. With Fred W. McDarrah's photos one can see clearly what we are losing. It is not a new crusade. The McDarrah image on the Home page that has "Save The Village... Wake Up Mr. Mayor" is from 1960, and is referring to Mayor Robert F. Wagner. Similar slogans probably first appeared on the walls of the caves at Lascaux. But it is a crusade where this time, the light at the end of the tunnel may be a freight train coming to run us over. One conductor is NYU, which is doing its best to destroy the neighborhood that gives the school part of its appeal. Another conductor is Rudin Management, which replaced St. Vincent's, the only hospital in the Village, with more million dollar apartments. Another conductor is the husband and wife team of Oscar Proust and Colleen Goujjane who were cited last week for without anyone's knowledge or permission destroying part of the doorway to their landmark 1834 carriage house (first owner: Aaron Burr) which is now the restaurant One of By Land Two if By Sea. Not to single out the folks above. There are many, many, many, many greedy evil demon landlords, developers and real estate professionals to be stopped. Calling them out on their activities, and highlighting what is being lost, is important. Won't try to replicate the general brilliance of EVgrieve.com, easily the city's leading news, entertainment and lifestyle blog. It focuses on life below 14th St and east of Broadway. And we'll be more narrow in focus than vanishingnewyork.blogspot.com, which accurately and amusingly calls itself, "A bitterly nostalgic look at a city in the process of going extinct." Instead, we'll focus our musings best we can on the ground the tours and the photos cover, as well as note places where McDarrah photos are currently being displayed, either in galleries and museums, or newspapers and magazines, or online. FEATURING MCDARRAH PHOTOS IN THE FIRST MUSEUM SURVEY TO EXAMINE THE RADICAL SOCIAL GROUP FOUNDED BY PUERTO RICAN YOUTH IN THE 1960S. Darn that is an impressive list! And THREE shows at the Museum of the City of New York at once? That is unheard of. The point is that there is a tremendous demand for photos (and the memories?) of a Greenwich Village fast fading. That is why you are reading, right?